The 10 Best Places for Bubble Tea in West Virginia! If you’re craving something wonderfully sweet and always refreshing, bubble tea is tops. Whether you’re looking for a classic variation or an option mixed with mango and peach, there is an impressive array of flavors available at the 10 best places for bubble tea in West Virginia. TK’s Bubble Tea has elevated bubble tea to a new level. Stop by the quaint Morgantown diner and try one of the many flavors of bubble tea to go with your order of delicious Thai curry soup or rice and steamed vegetables. In addition to bubble tea, TK’s has vegetarian and vegan products, smoothies, fresh juice, shakes, and slushies. They also carry in-season fruits and vegetables so you can make your own tasty treats at home. The Green Pineapple in Shepherdstown, West Virginia, started out serving the best bubble tea and snow cones, but quickly became a popular favorite and began offering a unique blend of Korean/Mexican cuisine that was not seen in the area. Open every day except Monday, the Green Pineapple has spicy pork belly sliders, bulgogi tacos, and some of the best kimchi that have excited locals since it’s opening. 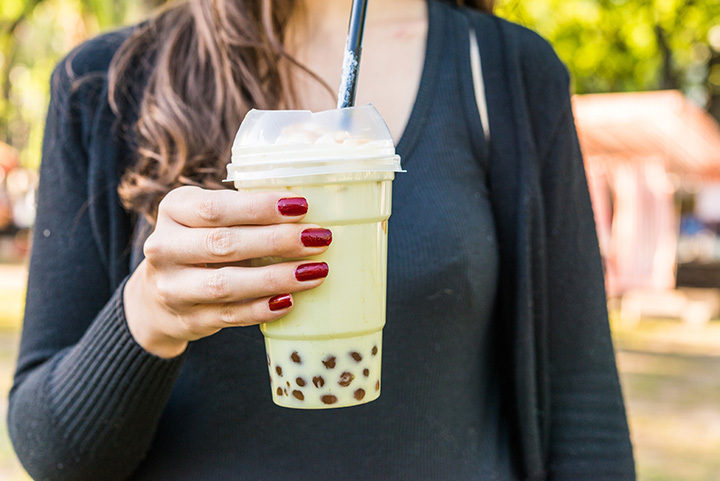 Make sure and try one of the foam bubble teas when you stop by for a special twist on a new favorite. You don’t have to travel to exotic and faraway places to enjoy international cuisine and drinks. Pho Vihn Long, located in South Charleston, West Virginia, can transport you there by the unique and flavorful Vietnamese cooking there. Using fresh ingredients, and textures that complement each other in everything they make, you’ll find all your favorite noodle soups like pho and rice dishes like chicken fried rice. They also have a great selection of menu items from sweet to spicy and everywhere in between. Wash your meal down with one of the bubble teas served here like avocado, papaya, taro, coconut, honeydew, mango, pineapple, strawberry, mixed berry, or durian. Located in a popular part of Morgantown, Lavender Café is a convenient and very popular place. College students love placing their order online, then either having it delivered or picking it up in person. Those who choose to eat in will find the cozy and casual eatery inviting, and with a nice selection of sushi and bubble teas. Open every day, you can find your traditional Chinese rice and noodle dishes, rice cakes, and chef specials, but the best thing about the Lavender Café is that it’s good food that won’t break your bank. Don’t worry, be happy. And eat at Fusion Teriyaki Grille in Charleston, West Virginia. Using the freshest and an all-natural selection of ingredients, Fusion Teriyaki Grille will surprise you with the innovation and creative menu. In the three short years it’s been in business, this little Japanese/Korean-inspired restaurant has become a very popular spot for dishes like spicy pork bulgogi, Korean short ribs, and shrimp teriyaki. They also serve fresh green or black tea, yogurt drinks, and refreshing bubble tea, also known as milk tea. Open every day, they’re available to cater your next event, too. The boba tea is Golden China includes flavors such as green tea, peach, mango, and passion fruit. Hungry diners will also find a large choice of favorites like chicken egg foo young, sweet and sour pork, pepper steak, kung pao shrimp, and chef specials like General Tso’s fish. For everyone who loves Asian cuisine, the Asian Bistro has to be a stopping place the next time you’re in Morgantown, West Virginia. The bubble milk tea here is to die for. And they also offer delicious Pan-Asian cuisine including items like crispy duck, beef negimaki, and spicy tuna tartar. Don’t let the small size of this little eatery fool you. Green Tea Asian Fusion is big on flavor. Located in the heart of Morgantown, West Virginia, you’ll find everything you want in a great restaurant—ordering convenience, great menu selections, good pricing, and delicious food. Be sure to try their refreshing bubble milk tea and pair it with a Thai, Korean, Chinese, or Japanese dish. When people talk about the Silver Dragon in Lewisburg, West Virginia, they talk about fried rice, bubble tea, and lo mein. They also talk about the large portions and reasonable prices at this surprising little find tucked away in the southeastern part of the Mountain State. Open every day but Sunday, you’ll find hot sandwiches and wraps, iced and blended drinks, bubble tea, and great Chinese food in a no-nonsense environment. Little Saigon is a unique Vietnamese restaurant located in Huntington, West Virginia that offers a place to eat featuring Asian cuisine and get hard-to-find items to make your favorite Asian meals at home. Their must try offerings? Pho and bubble tea. Without question.